Attest™ Biological Monitoring System us a convenient, reliable system for monitoring steam for up to 14 biological indicator vials. 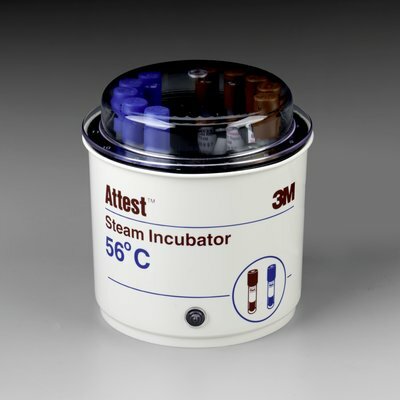 The ATTEST™ incubator is supplied pre-set at 56°C ± 2°C with results available within 24-48hrs. Pre-set to proper incubation conditions to ensure consistent, accurate results. Incubator automatically crushes the vial to release the medium. See through cover allows for easy observation and reading of indicator colour change. 14 vial capacity to meet the needs of both small and large laboratories. Self-contained – minimises contamination and false positive results.